Get your own acceptance letter from the Hogwarts school! This is seriously cool! I just received an email from the Harry Potter WBShop about this new product that I just thought was awesome! 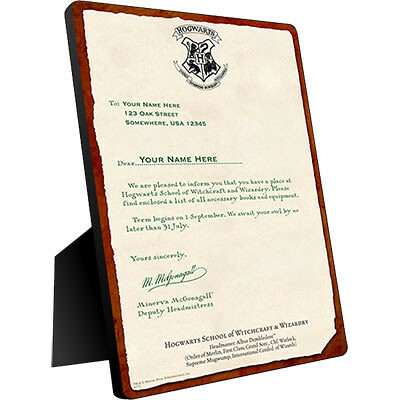 A WBShop.com exclusive, this personalized Hogwarts acceptance letter panel is a fantastic gift for any Harry Potter fan. You can personalize the letter for anyone — just read the instructions on the WB site for how to do this part. This letter is a replica of the one sent to all incoming Hogwarts students, printed with your very own name or as a gift for your favorite Harry Potter fan. Of course both versions are signed by Minerva McGonagall, Deputy Headmistress at Hogwarts. Printed on 1/4 inch thick Chromaluxe panels that don’t require any framing, these replicas are highly resistant to ultraviolet rays, scuffs, scratches, water, and fading. The panels include an attached easel so they can stand on any desk, shelf, or night table. It’s only $24.95 — pretty cheap by Harry Potter souvenir standards. I’m going to go order mine, now!